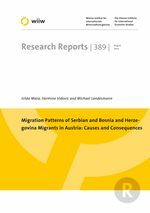 The study provides new empirical evidence about migration patterns of immigrants from Serbia and Bosnia and Herzegovina in Austria before and after the free visa regime implemented from January 2010 and January 2011 respectively for the two groups of migrants. In this framework a new survey was conducted and about 1000 migrants from Serbia and Bosnia and Herzegovina (BiH) currently residing in Austria were interviewed. Apart from the collection of standard demographic and socio-economic characteristics, the survey included specific immigration-related questions. The evidence collected through the survey allowed to examine migration intentions, distinguishing between temporary and permanent migration plans, human capital formation in the destination country and labour market experience of different groups of migrants. The results of the survey suggest that the preference for permanent migration is predominant particularly among BiH and the earlier group of Serbian migrants who moved to Austria before visa liberalisation. Serbian migrants who moved to Austria after visa liberalisation show a lesser preference for permanent migration. Serbian migrants and BiH migrants who moved to Austria before visa liberalisation were mainly driven by economic motives, such as taking up a job offer or looking for better working/earning opportunities. Those who moved during the free visa regime were motivated by better studying opportunities, better earnings and prospects of a higher standard of living. The skill composition of migrants is differentiated; there are more BiH migrants with tertiary-level education compared to Serbian migrants. However, Serbian migrants, especially those who moved to Austria before visa liberalisation, have considerably invested in and enhanced their human capital in Austria. Migrants are employed well below their skill levels and mainly have occupations that are classified as low-qualified jobs. In particular, compared to BiH migrants, the allocation of Serbian migrants to low-skilled jobs has been more pronounced among migrants who moved to Austria after visa liberalisation. Consequently, the differences in the level of qualification, type of occupation, adequacy of job qualification and competences, were reflected in significant differences in terms of earnings for the three groups of migrants. The access to social benefits or access to the health care system is strongly related to the length of stay. Generally only one third of migrants receive social benefits, mainly through family allowances, such as child and housing benefits. Migrants with permanent intentions have a better command of the German language and tend to use it more intensively in a family, working and everyday life context. Besides, this group of migrants – as compared to potential returnees – appeared to be much happier with the migration experience and with the decision to come to and live in Austria. The study and an accompanying Working Paper (see Mara and Landesmann, 2013) also analyses the incidence of over-qualification and skill-occupational mismatch among migrants which can be partly explained by factors such as human capital transferability, enhancement of education in the destination country but also partly by discrimination. Accordingly, policy measures that target the efficient use of human capital built in the country of origin as well as the enhancement of migrants’ human capital in the destination country would counteract the phenomenon of brain waste. Keywords: migration patterns, temporary vs. permanent migration, labour market outcomes, qualifications-job matching, integration of migrants, migrants from Serbia and Bosnia-Herzegovina in Austria, bivariate probit model regressions.